Triumphant return of the silent but deadly amnesiac super-spy Jason Bourne. This fifth installment in the franchise reunites the insightful duo of actor Matt Damon and director Paul Greengrass and wisely sidesteps the 2012 Legacy spin-off. This picks up nearly a decade on from Ultimatum to find a battle-scarred Bourne punching heads for money in a masochistic spiral of self-doubt and destruction. Luckily for Bourne, snooping veteran Nicky Parsons (Julia Stiles) rocks up in Reykjavik to hack into some more secret CIA files. She uncovers another secret black ops initiative and further information on the now defunct Treadstone case with direct links to Bourne’s shady past. The two dodge sniper fire and attacks from governmental spooks during an expertly-paced and nail-biting chase through austerity-struck Athens, with the whole sequence taking place during violent clashes between police and protesters. This is the first of many moments in this white-knuckle sequel which reminds us of why the Bourne films are so exciting under the helm of Greengrass and Damon. Barking orders back at CIA HQ is an old-world grump named Dewey (the stoic Tommy Lee Jones) who gives rookie chief Heather Lee (Alicia Vikander) a chance to prove herself by taking out Bourne. Bourne instead continues to infuriate governmental surveillance by dodging their bullets from London to Vegas. A sub-plot involving a young, Zuckerberg-style social media tycoon who trades personal data with the CIA directly references the Edward Snowden case but offers no definitive statement on the privacy rights of individuals on the internet in the light of national security. It’s the sort of story-line which wouldn’t have existed in 2007 when Bourne was last on our screens. It underlines just how quickly the world has changed and how security services have had to adapt their surveillance methods. 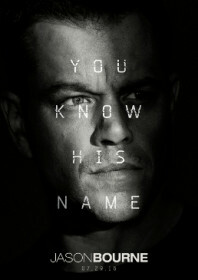 In light of this, Bourne cuts an even more isolated figure. Now aged 45, Matt Damon presents a haunted, world-weary vision of Jason Bourne. During the moments when he speaks (which is quite rare), Bourne is less concerned about international politics or even the fight against terrorism. Instead, he is still steadfastly focused on recovering his sense of identity. Despite this solitary motivation, Greengrass’ astute lens still offers a world view which is both informed and articulate, allowing the action to flourish in a more grounded, realistic setting. And, despite his age, Bourne is still up to the task; viscerally aware, physically prepared and nonchalantly remaining two steps ahead of the world’s leading police forces. It is an engaging premise which has yet to become tiresome.